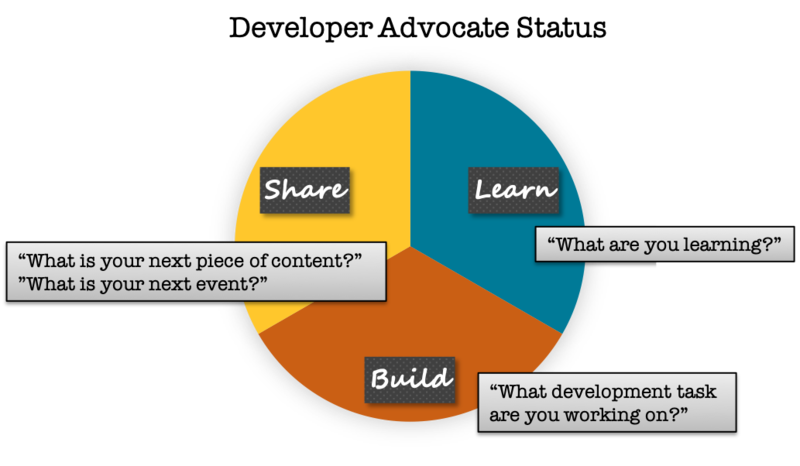 In my previous article “Learn, Build, Share”, I introduced a framework for how I try to spend my time as a developer advocate. Since I lead a team of developer advocates, I’ve shared this with them, and it’s been effective in helping us understand how we are approaching our responsibilities. A new year always brings opportunities for resetting and improvement. Since the team has grown a lot over the past year, we’re often moving in a lot of different directions — literally. I’ve been thinking in particular about making the most of the precious meeting times that we have. Note the implied expectation that you have something intelligent to share about each of the topics. That’s deliberate. The intent is not to be dogmatic, but to encourage this internal thought process: “I should be learning something new” … “I should be carving out some time to code” … “I should be sharing my knowledge so that others can benefit” … “I should be getting ready for my next event so I can communicate the most effectively” … and so on. This may raise a question in your mind — what is the forum in which to use these questions? I’ve gone back and forth in my mind a bit about using these questions in 1:1s vs. team meetings. For now, I’m focused on using the questions in our weekly team meeting. As each of us takes turns talking about the past week, we answer the questions above. Using this framework makes it easier to cover the important stuff quickly, and we are more focused in what we choose to share and less prone to ramble (especially me). While I do think this could be an effective framework for 1:1s, in my situation I didn’t want to abridge the contract that I’ve made with my team about 1:1s, which is that the agenda of the 1:1 belongs to the employee, not the manager. Now, you might think that opening the floodgates like this negates all of the structure that I’ve been touting above. Trust me, I was afraid of this given how much we all like to talk! It turns out that covering the bases using the structure above removes some of the cognitive workload of reporting status and actually frees people up to share some really creative thoughts that benefit the whole team. Developer Advocate helping you succeed with Apache Cassandra / DataStax Enterprise, cloud architecture, and distributed systems. Opinions are my own.